Bed ridden with a cold..
And training was going so well! What was supposed to be a 12+ hour training week turned out to be a 4+ hour training week because yours truly succumbed to the common cold...or at least that's what iI self diagnosed myself with. Caught it Thursday and now it's Sunday..still in bed. I was able to go to CT class on Thursday though since I didn't get symptoms until the afternoon. Coach is out at training camp in Tuscon so you know what they say, when the cat's out, the mice comes out to play. Class was especially whining and entertaining which made for many laughs in between hard 12 minute intervals. My favorite quote of morning in class was from Ted, "I'm going back into my cave..I'll see you in 12 minutes." I guess you had to be there. Between that and Matty trying to be a power weight lifter..it was a darn funny class! So does anyone know how to fast forward a cold? Anyone? Anyone? Being bed ridden for three days is getting old. Coach says I am not to re-engage in training until 1 day after I feel normal. I guess I couldn't have chosen a better weekend to be sick as it's raining cats and dogs out. It's been my tivo, versus coverage of the Tour of California and my little buddy the Mac Book Pro! I am really enjoying the ToC! Lance is back so the excitement level is just that much bigger! Did you know that Lance can hold 600 watts for an hour?! Holy sh*t! Most top pro cyclists can hold 450..maybe 500 according to cycling God Ekimov...holy crap..600!! How's that for inspiration?! Hope to re-engage early next week! 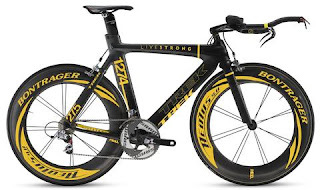 Oh yeah, APB on Lance's stolen one of a kind Livestrong TT bike...whoever stole it is dumb as a rock. Where you gonna ride it? Who are you going to show it to? You can't so give it back and maybe karma might be back on your side. You can't steal something that is helping fight cancer.. come on now!